If I were to choose a favorite berry, I think the strawberry wins. Blueberries are an EXTREMELY close second, but strawberries win. Apparently I'm not the only one who feels this way, since strawberry is the fourth most popular ice cream flavor in the USA. (vanilla, chocolate, and butter pecan are the top three). 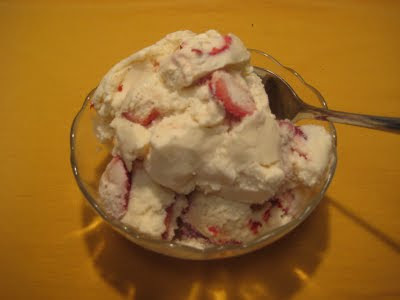 When Josh and Tony came over for dinner, I had just gotten my ice cream maker and they were happy to be my taste testers for my very first batch of ice cream which was , you guessed it, fresh strawberry. They loved it and I know you will too! Combine strawberries, lemon juice, and 1/4 cup sugar in a mixing bowl, set aside in fridge for 1 hour. In a medium saucepan, stir together milk and 3/4 cup sugar. Heat over low heat until you reach a low simmer, but not boiling. Meanwhile, in large mixing bowl beat eggs until light, about 2 minutes. Slowly pour the milk/sugar mixture into the beaten eggs stirring constantly. Pour everything back into the saucepan and continue to cook and stir over low heat until mixture thickens enough to coat the back of a spoon. Strain custard into a clean mixing bowl. Add cream. Drain the liquid from the strawberries and add it to the bowl along with the vanilla. Place bowl in fridge until completely chilled. Pour into ice cream maker and freeze according to the manufacturer's instructions. Stir the strawberries into the ice cream. Place in a freezer safe container and freeze until firm. I found that it's best to chop up the fruit into small pieces because larger pieces are harder to eat when they're frozen solid. Makes sense, right? Use this recipe for any kind of berries or fruit. Be sure to add the lemon juice because wakes up the flavor of the fruit/berries. Try fresh peaches, blueberries, or raspberries. YUM!